WASHINGTON (AllPolitics, May 20) -- In its ongoing floor debate of the tobacco bill, the Senate refused Wednesday, on a 58-40 vote, to consider raising cigarette taxes even higher than the bill originally proposed. 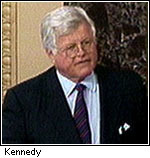 Looking to strengthen the anti-tobacco legislation, Sen. Ted Kennedy (D-Mass.) proposed raising taxes by $1.50 per pack over a three-year period. Supporters said the measure would do even more to reduce teen smoking than the original proposal of a $1.10-a-pack increase over five years. Kennedy called the defeat of his proposal "a victory for big tobacco at the cost of the lives of hundreds of thousands of children." He warned, however, it's "not over." Opponents argued that $1.50 per pack was such a high increase that it would create a black market. They also said the tax would most hurt adult, blue-collar workers. According to studies cited by opponents, adults with incomes under $30,000 a year have the highest smoking rate of any bracket and will pay 60 percent of the new taxes. The vote to table -- effectively kill -- the motion was a key victory for the tobacco legislation's chief architect, Sen. John McCain (R-Ariz.), and others who are trying to keep the sweeping tobacco measure from unraveling under the pressure of proposed changes from both ends of the political spectrum. 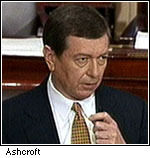 The Kennedy measure had won a preliminary round on the Senate floor Wednesday as the Senate rejected, 72-26, an attempt offered by Sen. John Ashcroft (R-Mo.) to forestall efforts to raise cigarette taxes even higher than now proposed. "Teen smoking is not the central thrust of what's happening here," Ashcroft said during the floor debate on the amendment. "This is a massive, massive tax increase on low income Americans and instead of helping children it is very likely to end up hurting children and hurting families." Earlier in the day, more than a thousand children joined President Bill Clinton and Vice President Al Gore at the White House for a tobacco-free morning. Skating star Tara Lipinski helped the White House play the "kid card" at a made for media event intended to influence the tobacco bill fight. 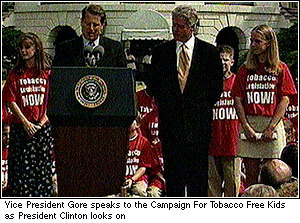 The students were all wearing "Tobacco Legislation Now" t-shirts, and Clinton urged them to take that message to the Senate. "You may well have a bigger impact on Capitol Hill than all the things we say here in the White House on the remaining undecided voters. Our lawmakers must now let this historic opportunity slip away under pressure from big tobacco lobbying," Clinton said. "I want you to go and see them," the president urged. "While you are up there, I want you to ask every member of Congress to go home tonight and think about how they can look you in the eye and say 'no' to your future."